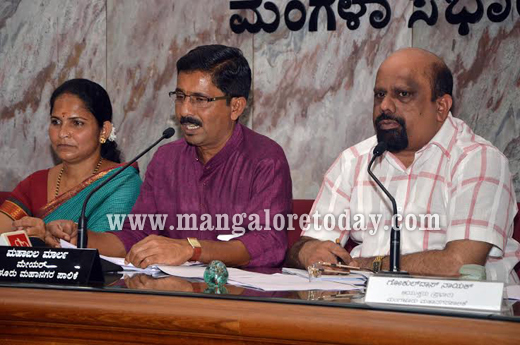 Mangalore, Sep 18, 2014: On September 17, Mayor Mahabala Marla has said that to include Mangalore in the Smart City project of the union government, the MCC had impressed upon the State government to cede Moodushedde and Bala gram panchayats to the Mangalore City Corporation. He said that the concept note issued on the scheme by the urban development mentions that cities with population of five lakh is eligible to be developed as Smart City. The population of Mangalore city as per 2011 census is 4,99,487. If two gram panchayats situated on the periphery of the MCC limits are attached to the Corporation, the parameter would be met and can apply for the project. “The MCC has already submitted a proposal and the Cabinet should give its nod to the proposal at the earliest, so that the proposal on Smart City can be prepared and submitted to the Central government,” he said. “If Smart City project is sanctioned to Mangalore, then the concept of Greater Mangalore will be strengthened,” he said. World class station : The Mayor said Mangalore Junction Railway Station will be upgraded to a world class station as it has sufficient land to undertake development works. A high-level team of Railway officials had visited Mangalore and held discussions with the MCC. The MCC will extend all its support to the Railways. The Railways have 25 acre land for the development and the process will be carried out on the public-private partnership. To supplement it, the MCC has decided to develop the road leading to Kankanady Railway Station near Naguri. Town Hall repair : Stating that the work on Town Hall in Mangalore has commenced, he said that it would be repaired at an estimated cost of Rs 2.5 crore. The Town hall will celebrate golden jubilee this year. The works to be taken up are paver-finish asphaltation of the road in the Town Hall premises, granite flooring on the portico, changing the seats, installation of AC, flooring, fall ceiling, repair of green room, construction of additional toilets, increasing the capacity of the generator, modernisation of interiors, electrification, sound and light system, new doors and windows, painting, water proof roof and construction of parking bay. The work will be completed in two months. Marla said that sign boards and information boards will be installed on major roads. For this, a sum of Rs 1.50 crore has been earmarked under Chief Minister’s special fund. He said that night shelter for destitute would be constructed at Kasba Bazar at an estimated cost of Rs one crore. Play grounds : The Mayor said a play ground and park will be constructed at Kodikal. The MCC has already identified five acre land for the same and has kept aside Rs 1 crore for the purpose. Another play ground will be developed at Housing Board colony in Kankanady. The MCC has earmarked Rs 40 lakh. The crematorium in Kadri will be modernised. 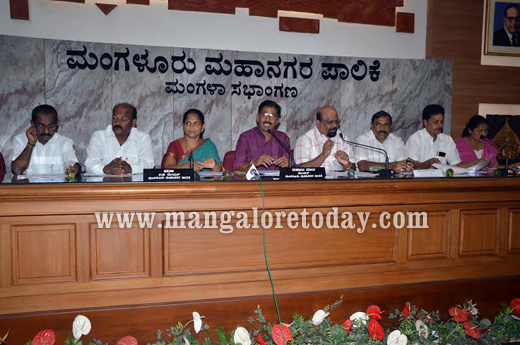 SAS resolution : Mangalore City Corporation in-Charge Commissioner Gokuldas Nayak has said that the resolution of the Council of cancelling the hike of SAS by 15 per cent with effect from April 1, 2014, had sent to the State government and is awaiting the reply. The SAS was hiked by the Deputy Commissioner who was the administrtor of the MCC before the formation of the council. The Deputy Commissioner had hiked the tax, as per Section 109 (A) of The Karnataka Municipal Corporations Act, 1976. As per the Act, the rates of property tax under the self-assessment scheme (SAS) should be revised once in every three years.